With four kids under the age of 11 in tow with me almost everywhere I go, I’m that person people in Costco feel the need to sympathize with by saying, “Oh dear, you have your hands full” (no kidding) or “Are they all yours?” (Yes, indeed they are). But even though my four look like they’re a lot of work and can cause different levels of stress on any given day, having them has really given me a greater appreciation for so many things in life. Take downtime for example – there is seriously no greater feeling of contentment than when we have no where to go, nothing to do, and we’re sitting around playing or watching movies in our PJs. Downtime is what keeps my family connected when things get chaotic. Because I have 3 young boys, we tend to reach for toys when it’s time to relax, and out of all of the toys they choose, Thomas the Tank Engine is still the clear favorite. They like Thomas because, no matter what type of play set they’re using, you can come up with a new way to play all the time. I like Thomas because he encourages their imaginations, and that’s nice for a mom to see when they frequently choose iPads or TV over playtime. Over the years we’ve collected hundreds of Thomas pieces, from smaller wooden train tracks to an extra-large Thomas train table. The last time we laid all the tracks and trains on the floor and train table my daughter looked it all over and said, “Mom, we collect Thomas stuff the way Grandma collects cats.” Which was really funny, because Grandma really does have quite a few cats. Although my older kids would never admit it out loud, they still love to get down on their hands and knees and build an endless variety of twisting tracks or create cute scenarios for my 4 year old. That’s why I know they’ll be just as excited as my little guy when they see the cool new Thomas the Tank Engine products hitting the market before Christmas. If you have a little boy who loves castles and trains the way my little boy does, the King of the Railway DVD is a win-win on all fronts. Released on September 24th, 2013, this DVD comes in English and French and lets you join in on Thomas and his friends as they meet new friends and put their bravery to the test when their new buddy Stephen goes missing. Portable playsets? Yes please! In the car, at school when I’m trying to help out and I don’t want to chase a bored preschooler, or for a weekend away, Thomas & Friends™ Take-n-Play™ playsets are a Mom’s best friend. This playset is inspired by the King of the Railway DVD, and lets you race with Thomas and the Troublesome Truck as they prepare Ulfstead Castle for the Earl of Sodor’s celebration. 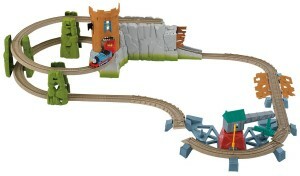 When it comes to adding to the fun of your current Thomas tracks and trains, the Trackmaster™ series is a great choice. Join Thomas as he searches across ruins for the missing King’s crown. 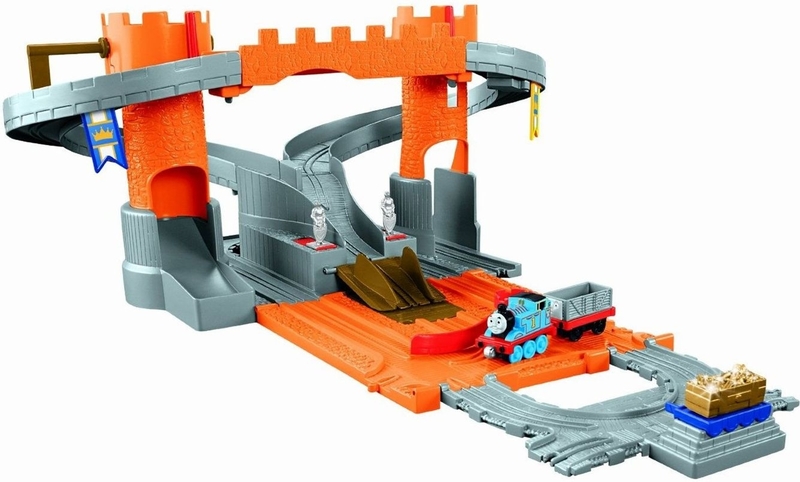 The Trackmaster™ Castle Quest Set comes with a crane your little one can use to maneuver the missing tracks so Thomas can keep sailing down the rails. Inspired by the King of the Railway DVD, this playset will be a sure hit, and a lot of fun to add to our Trackmaster™ sets. With a family the size of mine, we encounter hustle, bustle, and some crazy tussles on a daily basis, so it’s nice to pull the plug and just play. I feel fortunate that Thomas the Tank Engine has been such a huge part of our lives for the past 10 years, and I’m even happier they have these cool playsets and DVD out for Christmas this year. Not only can I look forward to more fun downtime with the family, Christmas shopping for my 4 year old is going to be a snap. Previous Which apps are worth the money?